Considered one of the great intellectual achievements of the twentieth century, James’s influential book seeks to shift the emphasis in the study of religion and psychology from the dogmas and external forms of religion to the unique mental states associated with it. This notable and influential study of the psychology of religion asserts that instead of the tenants of organized religion, we should look to the individual religious experiences as the foundations of religious life. As such, James makes his case with the religious accounts of various well-known thinkers throughout history, applying an analytic clarity to their stories and developing a pluralistic framework that defines the divine as a group of, rather than one single, qualities. The Varieties of Religious Experience presents readers with an intellectual, rather than emotional, call for both religious tolerance and respect. 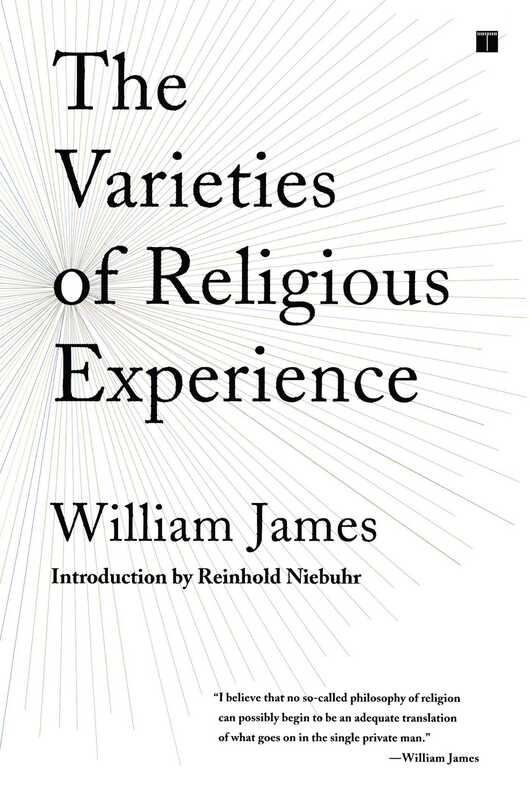 A popular edition of William James' justly renowned Varieties of Religious Experience is very useful because the attitude and method of the study, which made it a milestone in religious thought when James first delivered the substance of the volume as the famous "Gifford Lectures" at the University of Edinburgh at the turn of the century, represent as rare a combination in our day as sixty years ago. The combination is not only rare but creative. For James combines a positive approach to religion with a non-dogmatic and thoroughly empirical approach to the religious life and various types of religious experience. James inherited his life-long interest in religion from his Swedenborgian father. In terms of basic conviction his affirmative attitude rests upon a thoroughly empirical but very valid approach to religious faith. He defines faith as "the sense of life by virtue of which man does not destroy himself, but lives on. It is the force by which he lives." This definition of faith as an affirmation of the meaning of existence is drawn from and not negated by his anti-metaphysical philosophy, his empirical bent. He did not believe that it would be possible to give rational coherence to the many systems of structures which are manifested in life. But it would be possible to assert their ultimate meaning, despite incongruities, by religious faith. James was a rigorous opponent of the impressive and pretentious rational idealistic system of the German philosopher Hegel. In his volume "A Pluralistic Universe" he inveighed against a "Bloc Universe" and against any philosophy which identified the real with the actual. His anti-Hegelian bias establishes his affinity with such diverse anti-Hegelians as Karl Marx on the one hand, and Søren Kierkegaard, the Christian existentialist, on the other hand. His empirical attitude and his aversion to metaphysical systems, erected on the foundation of logic, whose abstractions have little relation to the life we live and the world we experience, place him in a stream of thought which began in the modern era, with David Hume, and which expresses itself in contemporary philosophy with the school of "philosophical analysis." The school consistently examines philosophical and religious statements with the criterion of the question, whether they have meaning. James was probably more ready to ascribe meaning and significance to religious statements than contemporary empiricists. James' empirical bent and scientific interest are partly explained by his rather unique academic career. He took a degree in physiology at Harvard, then turned to psychology and wrote a textbook on the subject before transferring to philosophy, to become America's most influential philosopher of his day. The largeness of his heart, transcending all philosophical polemics, may be revealed by the fact that his colleague and life-long friend at Harvard was Josiah Royce, the American exponent of the school of absolute idealism, or Hegelianism, which James so resolutely opposed. Royce, incidentally, was the second American to be invited to give the Gifford Lectures as James was the first. Royce's lectures were published under the title "The World and the Individual." The debate between these two giants in philosophy made the philosophy department of Harvard the most exciting center of philosophical learning in the nation. James' Varieties of Religious Experience proved exciting reading to his generation, and should prove equally exciting to ours not only because of the virtue of his affirmative, though critical, view of religion, but because of the catholic breadth of his sympathies and the width of his erudition in religious and non-religious literature. The examples of religious thought and life which he subjects to analysis are chosen from the widest variety of theological and religious viewpoints. He draws on the thought of Voltaire, Walt Whitman, Ralph Waldo Emerson and James Russell Lowell when these serve to illumine a point. Among the specifically religious writers and thinkers he skips over the centuries and over the theological fences to draw some illumination from such diverse religious leaders as Cardinal Newman, Martin Luther, John Bunyan, Jonathan Edwards, the Spanish Jesuit Molina, his Jesuit master Ignatius Loyala, François de Sales, and of course George Fox and Leo Tolstoi. He brings order out of the wide variety of religious experiences by categories suggested by his interests and empirical standards rather than by the traditional historical categories. He probably shocked his Edinburgh audience by delivering the first lecture on the subject of "Religion and Neurology" and under the topic examining the psychopathic aspects of many religious experiences. While he disavows sympathy for some of the varieties he examines because he thinks them to be significant, he has an obvious sympathy for those in one of his categories, "The Religion of Healthy-mindedness." Here his sympathies betray the understandable reaction to all forms of religious morbidity, particularly those of Calvinist and Evangelical sects, and the characteristic optimism of the late nineteenth century, which knew nothing of, and did not anticipate, the anxieties of two world wars and of a nuclear dilemma. When an example does not quite fit his categories he cheerfully admits the fact. Thus Luther's deep sense of sin obviously does not fit into the category of religious "healthy-mindedness." But James glories in the affirmative attitude of Luther's "Commentary on Galatians" because the sense of forgiveness and release from the burden of guilt is essentially affirmative and healthy-minded. Sometimes his categories are too non-historical to illumine the sweep of thought on a particular issue of the religious life. Thus he has a sympathetic chapter on "Saintliness" in which he does full justice to the quest for perfection in both the medieval ascetic movement and modern sectarian Protestantism. But he does not come to terms with the charge of Reformation thought, that the quest for perfection is bound to be abortive, since even the most rigorous human virtue cannot escape the ambiguity of good and evil, with which all human striving is infected. His chapter on mysticism reveals in what way mystic disciplines release from anxieties and contribute to a joyful nonchalance of life. But he does not come to terms with one defect in the mystic tradition: its tendency to flee the responsibilities of history and engage in premature adventures into eternity. An appreciation of any classic of philosophical, scientific or religious thought (and James' volume is a classic in all three categories) cannot obscure the dated quality of the thought. No degree of genius can lift even the profoundest mind completely above the characteristic mood of his age. Thus James' optimism is an obvious reflection of the mood of the late nineteenth century, a mood which he expressed succinctly in a little essay, now little known but given wide publicity by the peace societies. The title of the essay was "A Moral Equivalent for War." One need not examine the thesis of the essay carefully in this context, but merely observe that he found a rather too simple road to a warless world. Perhaps the chief effect of examining religious life in an untroubled era, and reexamining it in a more troubled era, is to reveal that even a rigorous analysis of the relation of religion to life neglects to survey the problems of man's collective and historical destiny. Living after two world wars and in the midst of a nuclear dilemma, we are bound to take the problem of the meaning of history more seriously than James did. It is perhaps a tautology to suggest that James' lack of interest in the problem of meaning and meaninglessness in the human drama is akin to his lack of interest in the collective experiences of men. For history is always collective destiny. James surveys the effect of religious faith upon the health and wholesomeness of the individual, upon the capacity or incapacity to withstand the strains of life; upon the ability to give up old ways for new, and upon the ability to accept the perplexities of life not with sullen patience but with a certain amount of cheerfulness. All these criteria of religious vitality and relevance have been surrounded by collective problems and perplexities. Our generation is bound to be anxious, not so much about the brevity of our individual life (though that anxiety can never be suppressed) but about the chance of the whole world escaping a nuclear catastrophe. We must worry not only about establishing wholesome relations in the intimate communities of family and friends. We must be concerned about establishing just relations in the increasing intricacies of a technical civilization. Even a genius like James, bound by the limits of his age, cannot help us with these problems of community and the meaning of human history. But the fact that his analysis of religious life is defective in these realms of current interest must not obscure the virtue of his creative approach to both life and religion on the level of personal existence. Copyright © 1997 by Simon &amp; Schuster, Inc.